The Mi Air Purifier MAX has 1000 m³/h CADR value for covering up to 120 square meters, and it comes with an advanced mute technology, noise level as low as 34dB. Smart dual air inlet system and triple-layer filtration can better purifying every corner of your house, in addition, OLED display, supporting Mi Home app control are its enhanced features. – 1000 m³/h CADR value, purification area of 120 square meters. – Smart dual air inlet system, increasing air area and better purifying your house’s corner. – Accurate laser sensor, to quickly eliminate dust, and its temperature sensor and humidity sensor detect temperature and humidity. – Triple-layer filtration with a filter life of 6-12 months, can effectively clean PM2.5 and other common harmful substances. – Advanced mute technology to reduce the noise level as low as 34dB(A). – OLED display, just needing one-button control. – Mi Home app control, check out the air quality, timing switch, applied area setting. 1. Search " Mi Home" in the "App Store" or "Google Play"
2. Create a Mi discount then sign in your discount. 3. Click "+ Add device", and turn on the WiFi of your phone. 4. 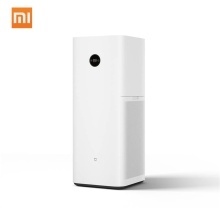 Enter the device name "Mi Air Purifier MAX" and connecting.